On September 22 seven brave folks, in spite of morning-long rains, met at Horsetrail Road for a tour of the Mitchell Hill area …led by a horse! The mare above is Zanzibar, a Tennessee Walker who did a fine job of leading the way and stopping to wait by her own command, if anyone got too far back. Turning around to make sure all were present before preceding, Zanzibar had brought along a human narrating friend to describe the history of the area, and to point out the small bridge, pictured below, built by local user groups. Workers back in December 2011 included: equestrians, hikers and mountain bikers all under the guidance and help of the National Park Service (NPS) maintenance crew. Also pointed out on the September walk were places in spring to look for Fawn Lilies, AKA: Trout Lilies, which lay like white stars in the deep, bright green moss on this, one of Zanzibar’s favorite trails. 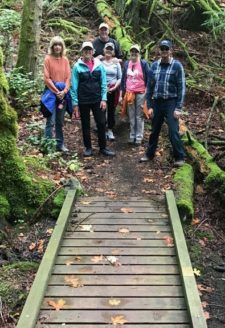 After reaching Briggs Lake, the group was led back along the Lake Trail where a huge ancient Garry Oak was pointed out with dragon-like bark. And where to look for Indian Ghost Pipes, a Saprophyte that looks exactly like its name and is mildly toxic but fun to see. Brave fun hikers who came out on a rainy day for a wonderful hike – Photo by Zanzibar who forgot to write down names. 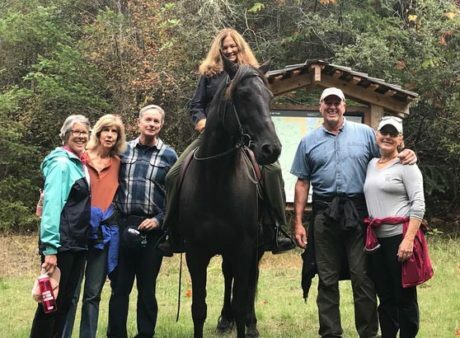 The group told Zanzibar and friend none of them had ever been to the Mitchell Hill Area which is part of English Camp and San Juan National Historical Park. Zanzibar and friend have heard this many times when offering directions or commenting on the beauty of the area to new friends met in the park. This group added they loved the trails we marched along. Along the way the group passed through the Roche Highlands area and then back into NPS lands. Roche Harbor Resort was awarded a National Trails Designation from American Trails Assn. This honor was awarded because of the allowed public use of the area by Roche Harbor, and the fact it neighbors the NPS lands which make endless opportunities to hike beautiful trails. The area is beautiful with well maintained trails, thanks to the NPS. 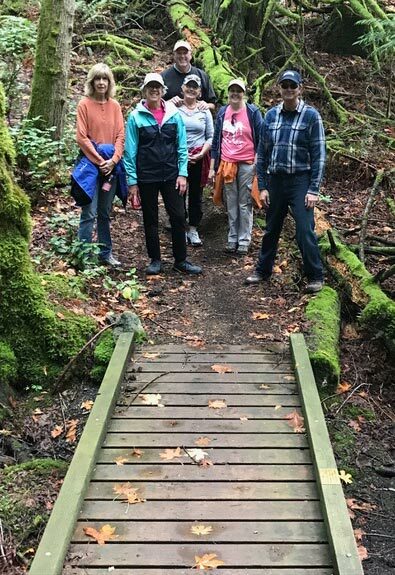 Many of the trails are kept open by the same volunteer user groups that built the Puncheon (low bridge) in the photo at right. But when this walk was planned last spring a massive group of trees had fallen and were blocking the trail. A quick call to the NPS and they cleared it in time. Thanks to the NPS, a favorite trail was open all summer! KYI Walks are arranged by Bill Severson of the SJ Trails Committee, under Island Rec, and happen at different times during the year. A great way to discover great hiking areas all around the island. The September walk was the last one scheduled for this year. Watch for them to start up again next spring.